Heat oil on high until it begins to slightly bubble. Whisk together Beer, Flour, Creole Seasoning, Parsley, Black Pepper, Hot Sauce and Garlic Powder in a large bowl. Test your oil with a little bit of the batter. Once your batter fries the instant it drops in the oil - you're ready. Dip Raw Green Beans into the batter one at a time and immediately drop into hot oil. 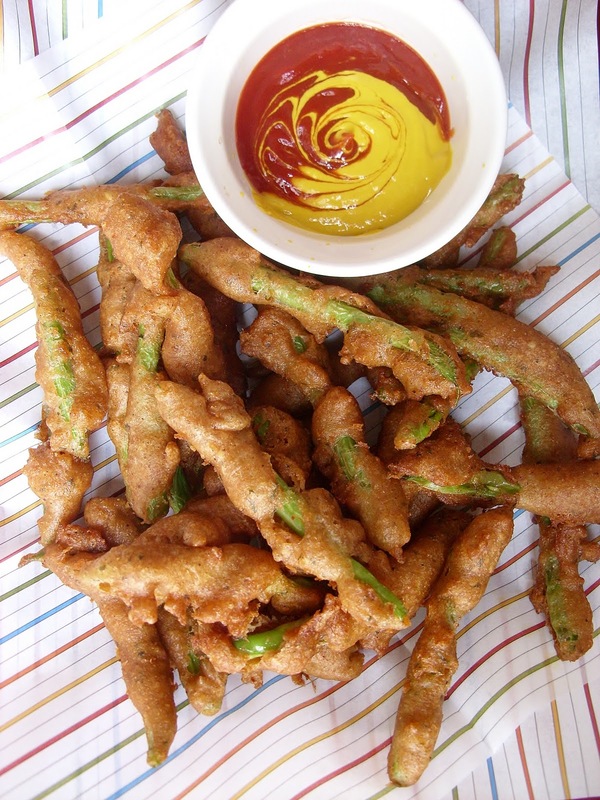 Only fry a few at a time so your Green Beans don't fuse together into some kinda hydra beast. Fry until they are a light golden brown and then move to a paper towel to drain off extra oil. Keep in mind your Green Beans will darken a bit as they cool so don't fry them too long. You want a nice golden brown crust. Your Green Beans are going to fry very quickly. Once they are all fried and cooled enough that they are still warm but you can eat them with your hands, serve them with a side of catchup, mustard or my favorite A-1 Steak Sauce. OOOh, those sound like a nice treat! The ketchup-mustard dish is quite lovely to look at as well! Good luck as you work towards the deadline. It is going to be great! mmmm those look amazing!! i must try these!!! These look astonishing, but since I never deep fry anything at home (lots of reasons) I won't get to try them, unless you know of an alternative way to cook them...??? Stupid question, I know. I just never figured out a way to deep fry without making a mess and getting all nervous and finding the right pot, etc. etc. Also, once your computer is fixed, definitely DEFINITELY get an external drive to back up all your posts, pictures, etc. Check out the Western Digital "My Passport" series, they are cute and Star Trek like :-) and they are easy to use. Beer batter makes everything better, right? I made beer battered sweet potatoes the other night, fantabulous! These are next up on my To-Try list!